Malta in the summer of 1942, a Malta wide open to air attack from the Germans and Italians and defended by a handful of Spitfires and a few anti-aircraft guns. Denis Barnham, a young and inexperienced flight lieutenant, spent ten hectic weeks on this indomitable island; he left well-ordered English aerodrome for the chaos and disillusionment of Luqa. His task was to engage the overwhelming number of enemy bombers, usual protected by fighter escorts, and shoot down as many as possible. The Spitfires were bomb-scarred and battered; often they could only get two or three in the air together, and the airfields were riddled with bomb craters, but they managed to keep going and they made their mark on enemy operations. 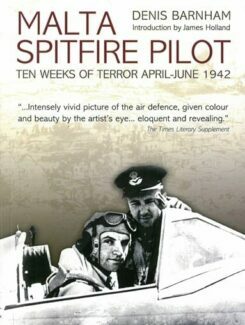 The author has written a powerful account of his experiences in Malta starting with his trip out in an American aircraft carrier through the ceaseless battle and turmoil during the desperate defence of the island, until his departure by air back to England, having seen the reinforcements safely landed and the tide of battle turning. His descriptions and illustrations of the air action are thrilling, but terrifying. 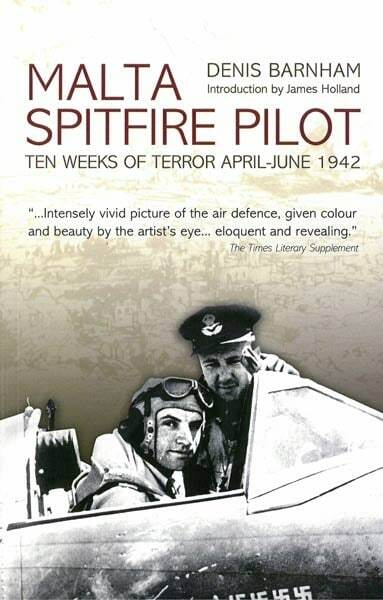 It is at times a very grim story but told with humour and compassion to bring, arguably, one of the best first-hand accounts of aerial combat ever written.